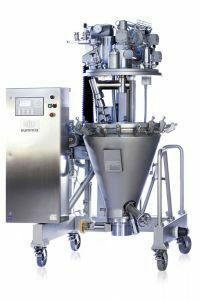 A contained system consisting of a centrifuge and dryer as well as a successful test series were the decisive criteria for a new customer in the food industry when choosing the HEINKEL Group. Foodstuffs manufacturers are subject to strict rules and regulations in order to avoid contamination. For the production of nutrition supplements a company in Northern Europe decided in favour of the HEINKEL Drying and Separation Group due to promising product tests as well as the suitable process equipment. The specification required was a contained system consisting of a dryer and centrifuge which corresponds to the ATEX directives as well as the strict regulations in the food manufacture. Due to their long-standing experience and the suitable processing machines the engineers were able to fulfill the customer requirements, where a competitor has failed in the past. The customer opted for a full system consisting of a HEINKEL inverting filter centrifuge and a BOLZ-SUMMIX conical screw vacuum dryer. The process requirements of the test series were very demanding. Two different products had to be produced with the same machine; one being dissolved in pure acetic acid, the other in methanol which implies a difficult separation and drying process. As the experts had to deal with compressible products, the possibility of thin layer filtration on the HF inverting filter centrifuge has proven to be a huge benefit. Both products had to be prepared separately before starting the drying process. In order to obtain the requested methanol content the process engineers modified the process apparatus for vapour stripping. However the product being dissolved in acetic acid could be conventionally processed on the conical screw vacuum dryer. Within only one week it was obvious that the objectives could have been reached exactly or rather for one of the products even could have been doubled. Due to the good centrifugation results the residual moisture could have been significantly reduced, thereby shortening the drying time decisively. The customer thus benefits from a higher throughput as the product can be processed faster. In this project, the corporate group proved its successful, cross-group collaboration and surpassed the customer requirements.